No school due to typhoon in morning, but actually it was just a hard rain storm, and it cleared up at noon. 3:00 - 14k with 7 easy out, 7 hard in. 1:15:30, splits 45:38/31:51 @6:14/4:33/km. Felt good coming back, helped by a (mostly) tailwind. Weights and core at the gym. 7:30 club track workout. 12.5k with 1200, 1000 x 2, 800 x 3, 400. 4:54, 3:49, 49, 3:07, 10, 12, 85. Felt ok. 1200 was warmup, Ran the 1000s well, eased up a bit on the 800s and 400. Starting to taper for Sunday's race. 12:30 - 8k easy. Legs tired. HS X-country meet. Before this year, no American School in Japan boy had ever broken 15:00 on the course (a hard, hilly 4.4km) - that's about 30 years. Today, we had 3 under 15:00 - quite amazing. 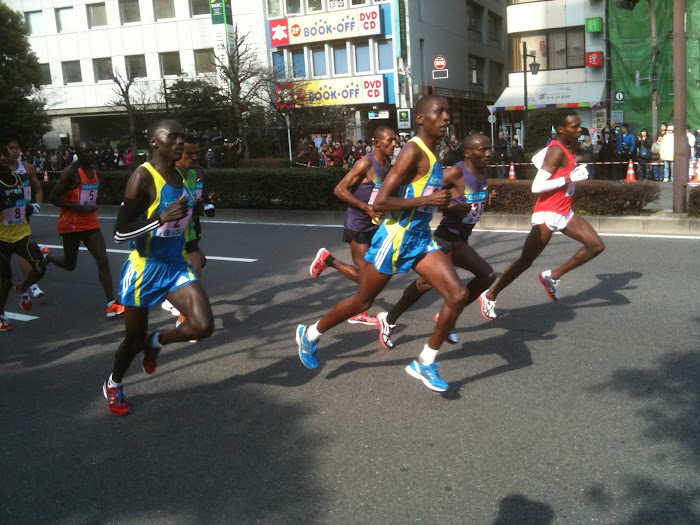 Nagareyama 10K road race. 38:51, 3rd in 60s age group out of 368 men. Overall 157 out of about 3,600 total. It was in Chiba prefecture, 2 hours travel from home. I felt good and ran well. Knew there were two 60s ahead of me, but couldn't catch them (they started further ahead). They ran 37:45 and 38:14, so were well ahead. Thought I was in 3rd, but wasn't really thinking about it, was just trying to run a good time. Held back a bit the first 7k, then went harder, but even so the first 5k was faster than the second. Splits: 3:46/57/51/48/49/52/4:05/54/56/53. Not sure why the 7th was slow - there was a hill and I guess I slowed a bit. Worked hard the last 3k, mostly running alone. My goal was to run in the 38s and win the age group or at least be in the top 3, so was happy to accomplish that. Course was pretty flat, a few short hills, nothing difficult. Weather was perfect - 21C/70F, no wind. This was a really good race from all viewpoints (except I only got a medal and a small towel), I wish I had known about it in previous years. Next year I'll go back and run 38:00. But in order to do that, I have to think about my training. The race effort was really much harder than anything I do in training. Of course, that will always be the case, but...it should be "harder", not "MUCH harder." I need to do more to prepare for race efforts. Maybe I will take an extra day off - Friday - and go harder on Saturday. Instead of 3k intervals, do a hard 10k effort. Or a hard/long hill workout. I have a half marathon next month (16th), which I think is going to be very tough. Damn good race time I think. Yeah, I thought that 4.05 was slow too! Nice work Bob. You have to be pleased with that. I liked your thinking around making the odd training day that much harder. More to train the mind than body I suspect? Great result Bob. That time would have got you second place in the Irish National Championships back in April (winner in 36:42 second in 39:14). There are obviously plenty of fast M60's in Japan. Very tough indeed - but you gotta be pleased with that. Geez, only 3rd with a time like that! I'm sure you'll figure out the 38 secret Bob. You've inspired me to try and hit a 4:05 on the downhill k at Stromlo this summer.